We are always on the look out for stories from across countries. Nothing better to capture the ethos, philosophy and way of life of a region. I was lucky to find a collection of picture books on my visit to Srilanka. These books are from a publisher by name Sumitha Books. Most of the tales have been written/ retold by JB Disanayaka. Many of these books have been illustrated with a distinct regional flavour by either Nirupama Mahagama Sekara or Jagath Punchihewa. One series is called Once upon a time and is a collection of old tales that offer a peek into the village life of yore in Sri Lanka. The title we enjoyed most was " Have you ever eaten Hotteripanchan?" A forgetful villager yearns for a sweetmeat whose name he forgets! There is a another series titled Wisdom of Folk. They are centred around proverbs and have a tale to bring it to life. A word of caution, some of these folk tales depict domestic violence and could be a bit disturbing for a sheltered child. The illustrations are what got me- rich, colourful and lively when it comes to village themes and cheerful and tropical when the theme is animals. 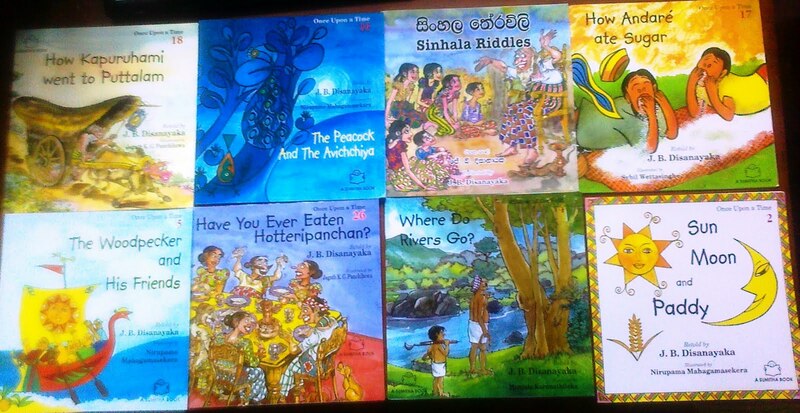 These books are separately available in English and in Sinhalese versions. The language is fluid and the large font makes it easy for the young reader. Ideal for ages 5- 8yrs. The same publisher offers a bilingual Sinhala Nursery rhymes ( the World of Animals) where the rhymes are in Sinhalese and English with music notes as well. The Sinhalese version is also transcribed in English script- in case a child unfamiliar with the vernacular script wants to say it in the original language. This gave cause for some merry music making at home. 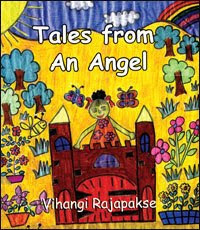 My most interesting find was Tales from an angel, by a six year old Sri Lankan girl, based in London. This one is from Gunashri Publishers. The young writer is Vihangi Rajapakshe and has written and illustrated the book herself! It is a collection of stories and poems and while I think it would be unfair to review a child's work, we enjoyed the poems/ rhymes more than the stories. The drawings are charming enough but it is the vivid colouring that took my breath away. For those familiar with Indian picture book scene, the books reminded me of Tulika in terms of size, styles of illustration and colour but are more like the DC- Mango books in terms of the glossy paper and finish. Some Srilankan books are available for sale, online. :) Lovely art.. I want to come read these books at your home right now!! I love books that feature native art & folk stories. Gives us a glimpse of the village life without actually having visited them. "...look out for stories from across countries. Nothing better to capture the ethos, philosophy and way of life of a region..." How true! Welcome here and may I add that we look forward to your book!